This entry was posted in Hindi and tagged Abhimanyu Singh, Anurag Basu, Anurag Kashyap, Arjun Mathur, Hindi, I Am, Indian Film Festival, Juhi Chawla, Manisha Koirala, Nandita Das, Onir, Rahul Bose, Sanjay Suri. Bookmark the permalink. Thanks for the writeup on this film. It does sound very compelling, but at the same time, as you noted, I’m not sure I would rush out and try to find it; or even watch it if I stumbled on to it. It would depend so much on my mood. From your description, it sounds like the first story (with Nandita Das) is the most contrived. I say this because I don’t really know how many women in India choose either single motherhood or artificial insemination as a means to achieve that, or indeed, if there are any sperm banks in India for this purpose. To me this strikes a very jarring note, as of a story that is very plausible in a different country being imposed onto the Indian setting. The other three stories, OTOH, even if they deal with little talked about issues, are more organic to the place, I think. One question I had was, was there any attempt in the film to draw parallels to the plights of the characters in the four stories, to have a thematic unity? By this I mean, for example, in the last story, there is a section of the community which is clearly being oppressed. Was there any attempt to link their oppression to that of the people in the previous two films, even if that is of a different type? For example, in the U.S., there are a lot of parallels drawn between the fight of gay people to overcome negative stereotypes and that of women to do the same; moreover, it is recognized that part of the reason for the oppression of gay people is because of the stereotyped gender roles that hold back women. I am wondering if there was any of this kind of linking of oppression, so to speak. The first story, from what you have said of it here, doesn’t seem to lend itself to fit into this kind of framework, but maybe that, too, can be made to fit. As an aside, I think I read that the opening film to this festival was Dabangg? I guess you didn’t write about it since you have already reviewed the film. Did you even go to see it, or did you skip it for the same reason? I am wondering what the audience reception to it was at the festival. Did the audience consist of mostly newcomers to the Indian film experience, or experienced viewers? I am curious about the new viewers’ reaction, if they were there. There are parallels drawn between the characters in the film but it’s not quite as clear cut as you describe. All the characters are fighting to overcome the events which have shaped their lives rather than actively fighting against the source of the event. So for example, rather than fight against Article 377 or even the police corruption, Jai celebrates the court decision that changed the law in July 2009 and changes the way he lives his life. Rather than fight against the forces that displaced her family, Megha lives in exile but revisits her former home in order to be able to move forward with her life. Onir has written that I Am is a ‘film about people with fractured lives held together by unbroken dreams’ and it seems that their stories are really about how they achieve those dreams and put their lives back together. The audience reaction to I Am was very positive. People asked questions about the meaning behind some of the symbolism and why Onir had chosen these particular stories to tell. The audience was predominantly Indian, but there was a reasonable group of people from other backgrounds. I would say that most of them had been to see other independent Indian cinema before judging by the questions they asked, and most people had seen at least one of Onir’s other films. For the other films I’ve seen the audience has been mixed and since I mainly went to films in the ‘Beyond Bollywood’ section they were regular film festival goers rather than Bolly addicts. Sadly most of these weren’t very well attended and I hope that next year we get a few more mainstream films from the South as I think they would get bigger audiences. That said, I enjoyed the opportunity to see some of the less well known films this year, even if they didn’t all live up to expectation. Sorry, I’ve been really rushed for the past couple of days, and still am, so I just wanted to say thank you for your detailed reply. This sounds very interesting! But it also sounds like a DVD purchase for me, so I can skip the difficult parts. And Bollywood or no Bollywood style story, I’ll be so happy to see Juhi in a good role 😀 Yay! With I Am, what I probably wasn’t very clear about is that their sexuality doesn’t seem to be the important facet of these characters. It’s almost incidental that Abhi is unsure about his sexuality – the real issue is the abuse he suffered as a child and its long term effects on him (although one of these effects is his confusion about his sexual orientation). Similarly with Omar the story is about the corruption and intimidation rather than the gay characters – or at least that was how I felt. Onir has made their sexuality a lesser part of the story – its not as important that these characters are gay, but rather that they are victims of corruption because of an outdated law. I hope that makes sense – I really need to see the film again to see if I get the same feeling from it a second time. I was so shocked at what was happening that I may not have managed to take it all in! I don’t think you’ll skip it though – just fast forward to reassure yourself it’s not too hideous and then watch it for Rahul Bose who is truely outstanding in my opinion. 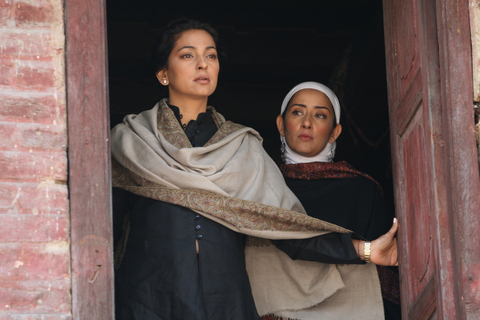 And yes – Juhi is great, as always. It was wonderful to see her in Melbourne and to hear her speak about Megha’s story 🙂 And her story, although just as confronting is an easier watch. I’ve heard much about this film, also about the facebook page and it sounds very attractive for me… But Nandita Das has acted in various films, hasn’t she? Yes, I think Nandita Das is probably better known for her acting, but she has directed a film as well (Firaaq, which is on my pile of films to watch). I think it’s interesting though that the other two directors, whom I don’t think have acted in any other films, were playing quite important roles in I Am and did a really good job too! I hope you get to see it soon. Thanks for this write up. 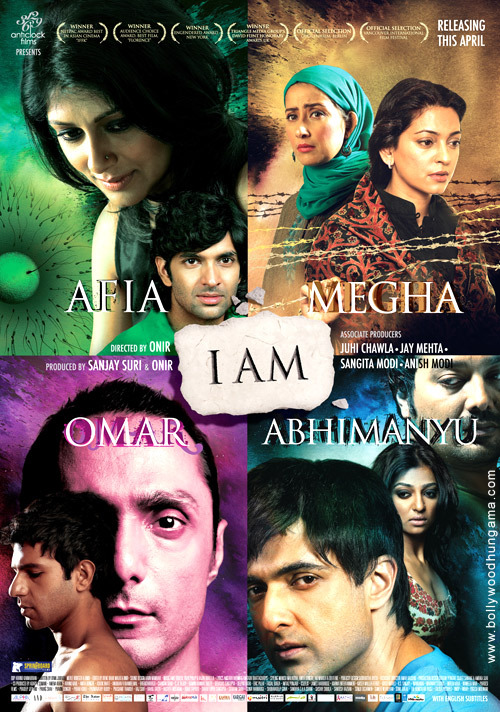 We’ve been closely working with Onir to promote I Am and I’m so glad its finally out. He originally had planned to make these individually but he’s a direct who forever struggles for funding. In the end I think the four stories work great together and personally I love multi storyline films. I look forward to seeing it even more now that I’ve read your thoughts. I think the four stories work well together and make for a stronger film. Each individual story works well in its own right, but the combination and the way the film progresses is very effective. Hope you get to see it soon!